Obviously my passion is for printed books, but my interest in Hoyle can lead in strange directions. 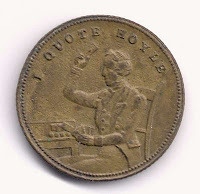 One example is this nineteenth century token used for scoring at whist. The image was used on the cover of the issue of Script and Print that included my article on the Hoyle piracies. I recently found a couple of Hoyle items that are even more unusual. Pictured below is a lady's fan. Be sure to click for a larger photograph, as I've loaded high resolution images that you'll find rewarding! As you can see in the detail at right, it is titled The Games of Whist, Quadrille, Lansquenet and Quinze agreeable to the late Improvement on Hoyle. &cc. Hoyle??? Well, as much as I have studied Hoyle, I had no inkling that such things existed! This fan and another pictured below are now part of my collection. I have spent many years learning about printed books, but am a novice when it comes to fans. It turns out that under a 1735 law, English printed fans must bear the date of issue and the name of the publisher (de Vere Green, p76). Indeed this fan was published by T. B. on January 6, 1791. The mount is engraved and colored by hand, while the sticks are sandalwood. It will be an interesting project to determine how much of the text, which I've only just started to study, is Hoyle's. Hoyle never wrote on Lansquenet or Qunize, and those portions seem to be abridged from Hoyle's Games Improved, edited by Charles Jones (1775), discussed in an earlier essay. 1. Begin with the suit of which you have most in number...2. If you hold equal numbers in different suits, begin with the strongest...3. Sequences are always eligible leads. (pp.1-2). This sounds better. Certainly the use of "eligible" is suggestive. As noted earlier, Payne's text was incorporated into Hoyle's Games Improved in 1779. All of the whist texts are so similar that it will be difficult, I think, to identify a source definitively. The text on Piquet begins "To gain the point generally makes 10 points difference, therefore when you discard you must endeavor to gain it, but not risk the losing of the cards." This comes from A Short Treatise on Piquet (1744) where Hoyle wrote "To gain the point, generally makes ten points difference; therefore when you discard you must endeavor to gain it, but not risk the losing of the cards by so doing." (pp.4-5) But for Hoyle, this is his fifth general rule for piquet while the fan ignores Hoyle's first four rules. The fan is an example of the aide mémoire, "a particular class of fan which relies for its embellishment on the printing of information of a practical kind upon its mounts." These included cartographic, historic, and botanical subjects, as well as "words and music of songs, the rules and scoring for a game of cards, directions for the figures of country dances..." and so on. (de Vere Green, p.88). The second fan has the same text, but the engraving is of a lesser quality. The sticks are lacquered in black and gold. No date or publisher appears, but as de Vere Green notes, the required information was almost always printed on the lower part of the mount and is often trimmed when pasted on the sticks. (p. 75). Or, I wonder suspiciously, was piracy as much a problem for fan makers as it was for booksellers? Bertha de Vere Green, Fans Over the Ages, A Collector's Guide. South Brunswick and New York: A. S. Barnes and Company, 1979.